– echoed so many years later in Sergio Leones Dollars Trilogy. All gunfighters are lonely. They live in fear. They die without a dime, a woman or a friend. 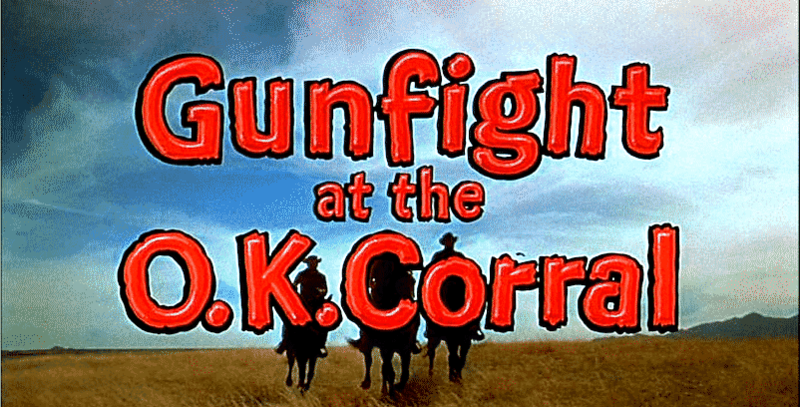 One of the finest and most memorable westerns of the fifties is GUNFIGHT AT THE OK CORRAL! 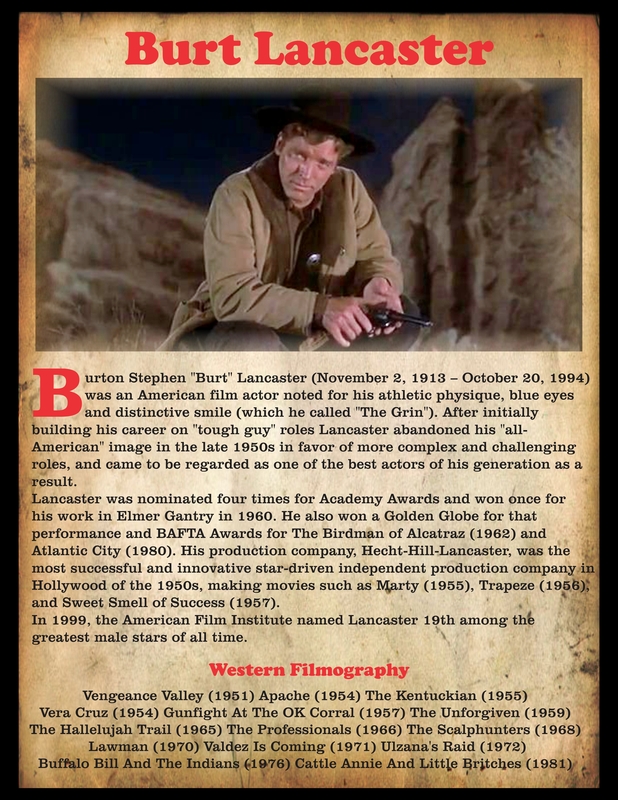 A splendid Vista Vision Technicolor presentation based around the famous shootout that took place in Tombstone Arizona on the 26th October 1881. 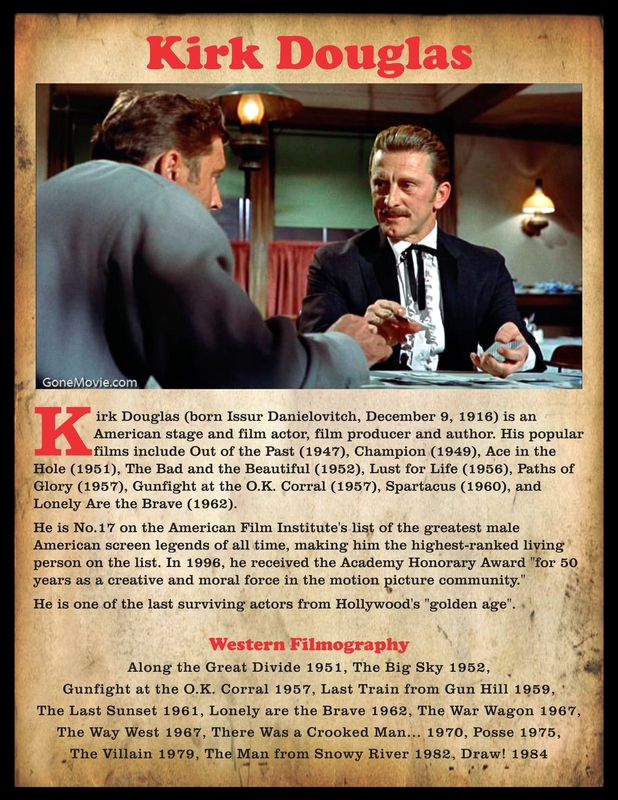 Produced by Hal Wallis for Paramount Pictures in 1957 it was masterfully directed by John Sturges and mightily cast with Burt Lancaster as the great frontier lawman Wyatt Earp and Kirk Douglas as Doc Holliday. The combination of these two heavyweight stars playing the leads plus the movie’s catchy fire cracker title assured the picture’s box office success. From an excellent screenplay by Leon Uris it was stylishly complimented by the brilliant and glowing cinematography of Charles B. Lang together with Dimitri Tiomkin’s rollicking score including the clever vocal sung by Frankie Laine which operatically guided us through the narrative. “I never lose. You see, poker’s played by desperate men who cherish money. ‘The Wild Bunch’ … doing ‘the Walk’? $”250 Fine” !!! That’s pretty steep. In 1880 this was more money than many folks made in a year! The Earps and the McCoys? 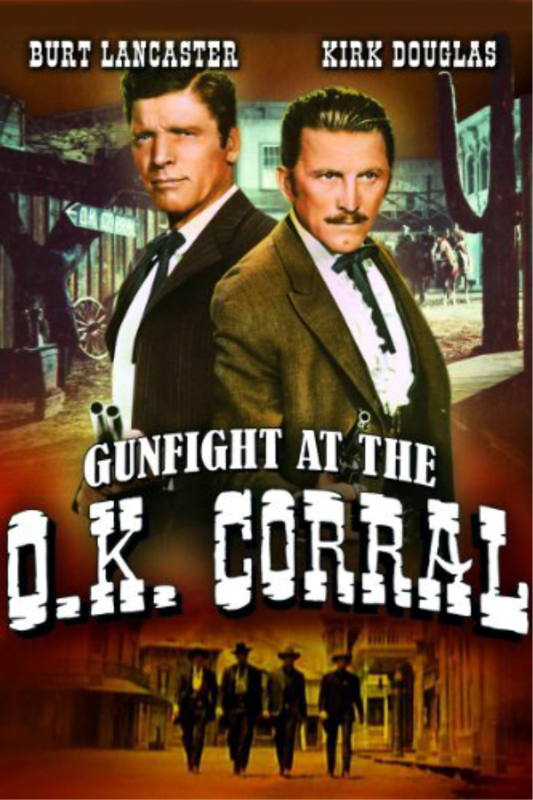 An (original) TV Star Trek did an episode called Spectre of the Gun (1968) revolved around the gunfight at OK Corral. The kicker was that Deforest Kelley (Dr. McCoy of Star Trek) had played Morgan Earp in the original movie Gunfight at the OK Corral. This is fabulous stuff. You’ve done a huge amount of work on this … and it’s absolutely gorgeous!! My husband will love this site. He is a total western movie addict. I’m sending him the link. You guys should get on very well. I went to see this with my mother when it came out in the movies. We got there late and wound up having to sit in the second row, so I remember the head of Bert and Kirk were twenty feet high. It’s still one of my favorite old westerns, though I am even fonder these days of Tombstone. But this one is so branded into my psyche as THE ultimate OK corral movie, I will always love it. Just revisited this post AGAIN. It’s become ritual. I love it! Thank you!! Thanks Gary – I’m very happy that a few people are enjoying the site. Unfortunately, I’m one of those damn Virgo perfectionists and every time i look at thingsI see some editing I want to do … I’ll never get finished ! You know we’re going to keep nagging you about your memiors eh ? 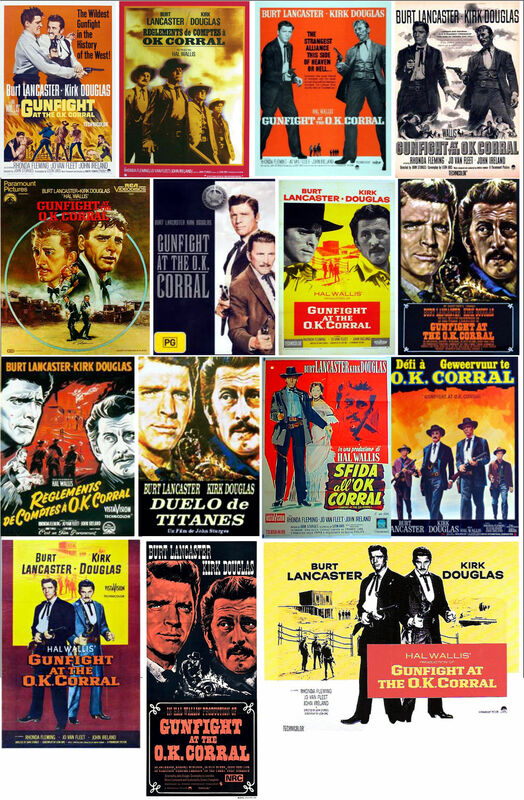 wow, very well documented article, one of my fav’ westerns too… Beautiful pics, with a lot of posters, I Like it. You can see one of my drawings about this movie (http://www.stars-portraits.com/en/portrait-224077.html) a second on my wordpress blog (http://www.riowestern.com/douglas-kirk/). Beautiful Blog, you’re talented ! Thank you Friend ! I’ve looked at your site. Nice work. You have proven your technical masterful of medium. NOW .. keep going ! You will then move past an invisible barrier and break into the open – displaying your own unique style. 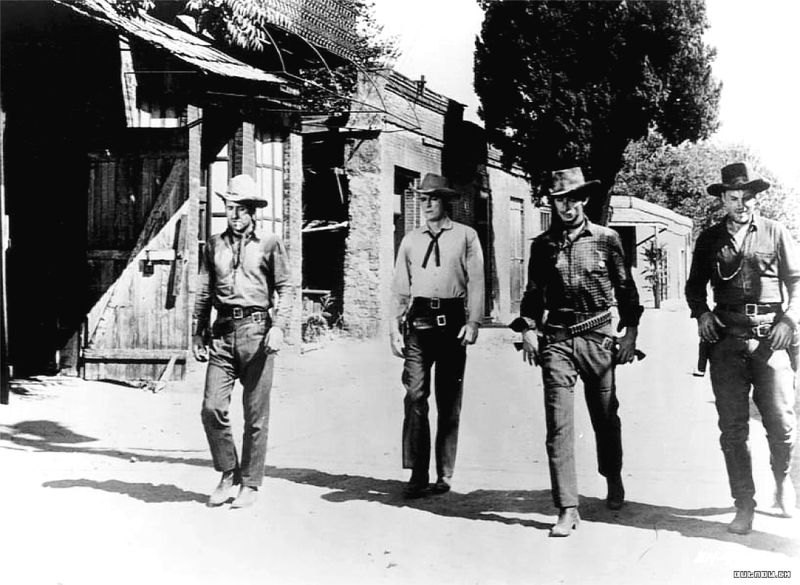 In the photo from The Wild Bunch….. of the 4 guys walking….. that’s not Edmund O’Brien on the far left, it’s Ben Johnson next to Warren Oats. I know the movie well, and I know all the actors. Check it out on imdb. Dang ! I’ll have to fix that. I know that’s Ben Johnson – the great Western actor. Just a silly mistake. Your artwork is wonderful. You inspire me. 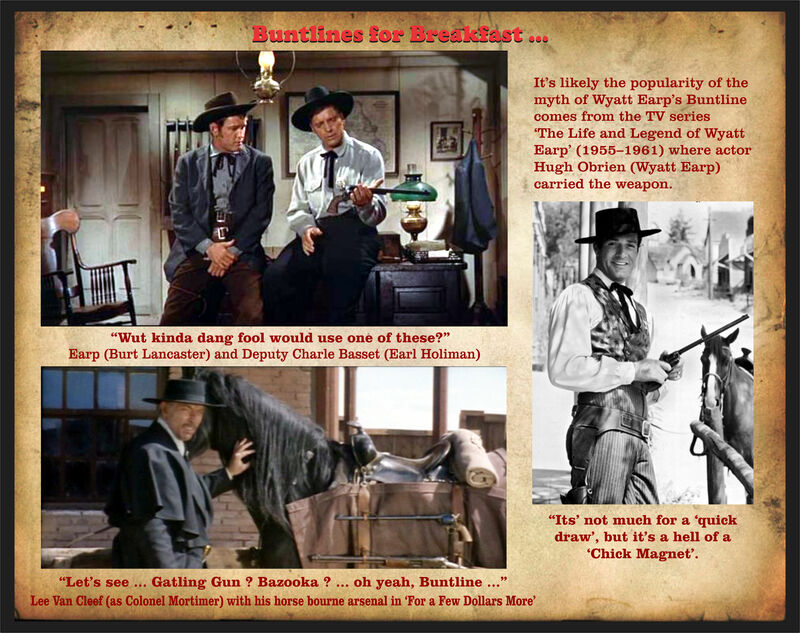 Yes, Kirk and Burt – two iconic Western Greats. I never get tired of this movie. This is a very good western thanks mostly to the talent of, and chemistry between the 2 leads, Lancaster and Douglas. They did make a great team, didn’t they? 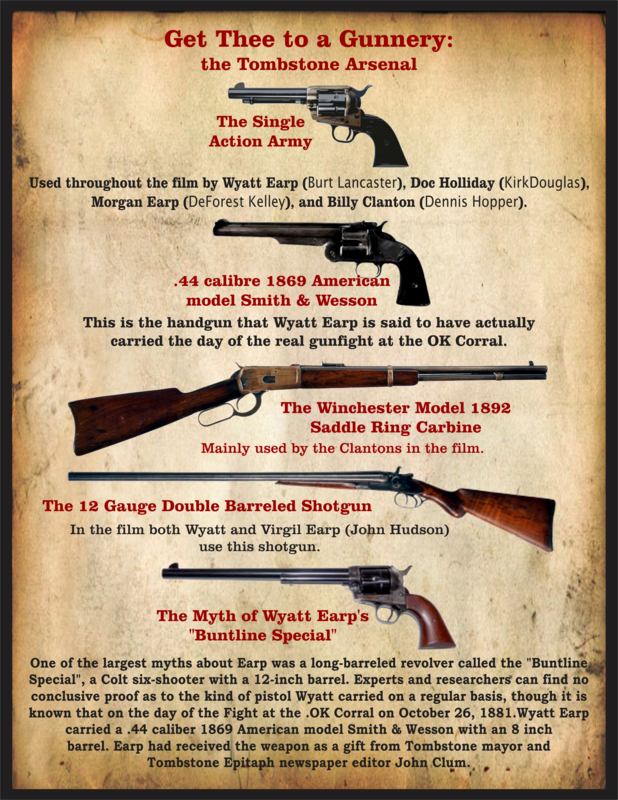 I would also like to address the historical inaccuracies by pointing out that there has never been a historically accurate movie about Earp, The OK Corral, Billy The Kid, Wild Bill Hickok, or any of the other legends of the west, unless you count documentaries. Speaking as a Western movie fan, historical accuracy is not why I watch westerns. It is the action, drama, gunfights, and interesting stories with well-defined characters. I take it with a grain of salt, and accept it as what it is meant to be – entertainment. 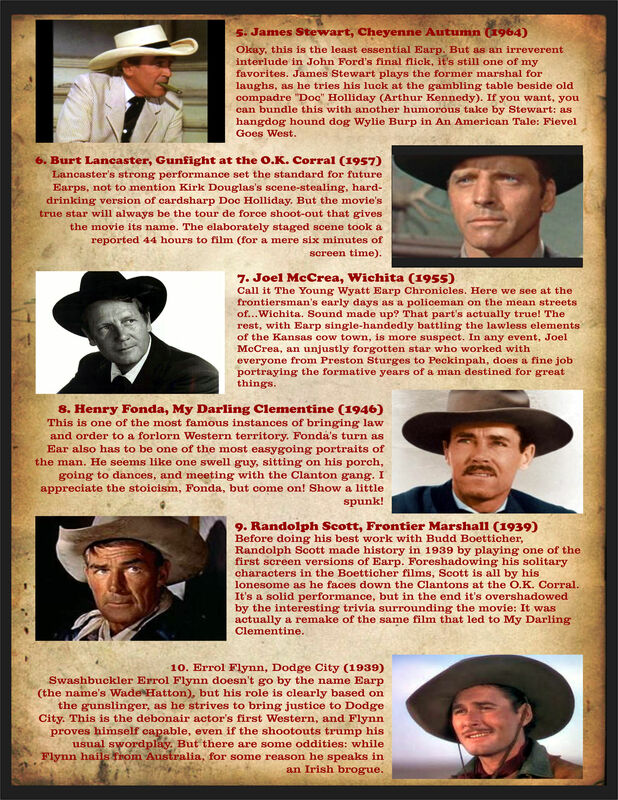 If the westerns were all accurate portrayals, they would be pretty dull. Like you pointed out, the real gunfight lasted a total of 30 seconds. 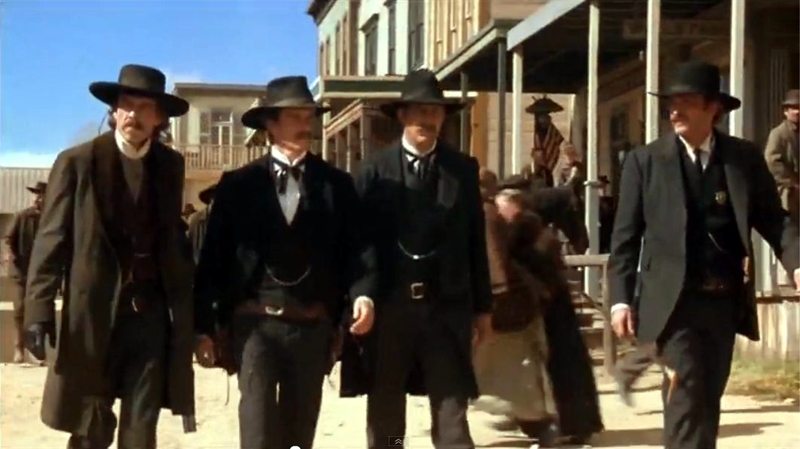 I watched a show on TV that re-created the real gunfight as best as could be determined from historical accounts. It was pretty quick and not that heroic or glamorous. The showdown in the middle of the street was also pretty much made up and probably only happened that way in a couple of incidents. 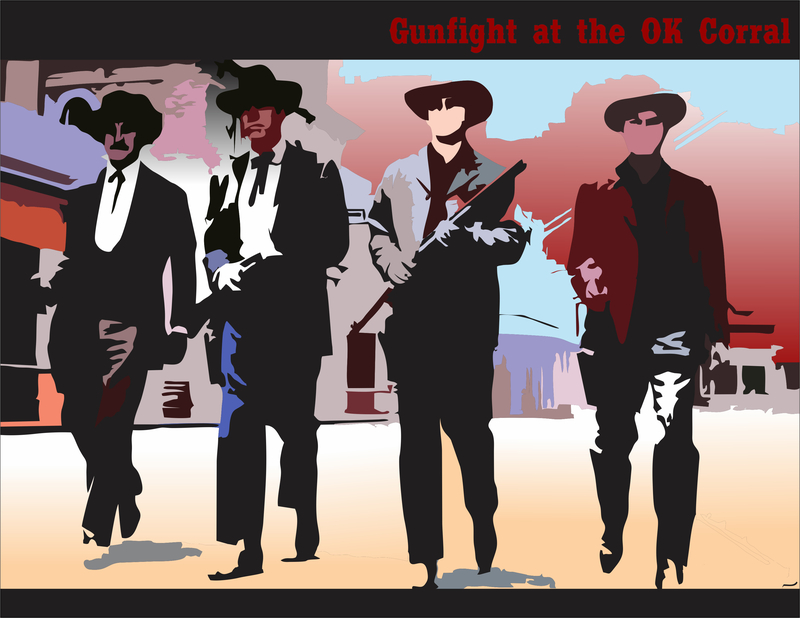 Most gunfights began with the opponents already having their pistols drawn and ready to shoot. Even the most historically accurate version, Tombstone, takes artistic liberties to move the story along and make it more entertaining. 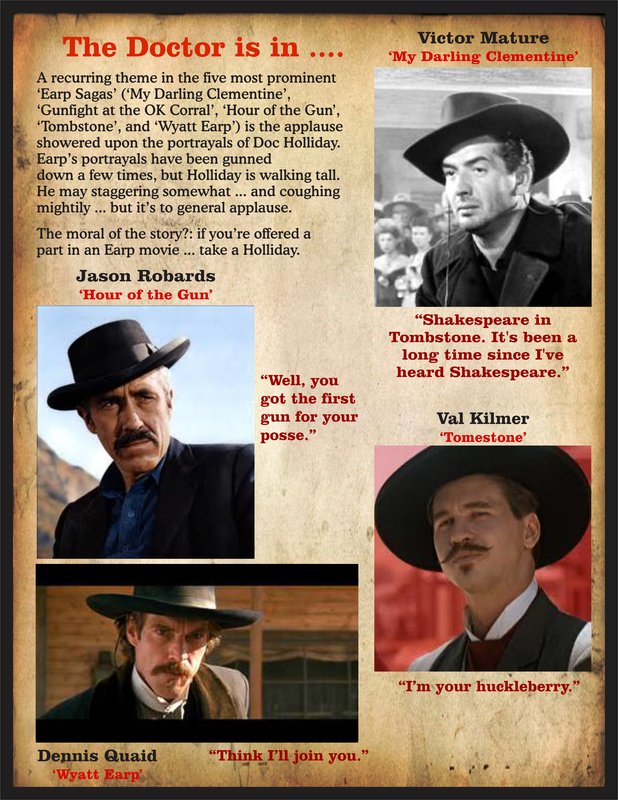 Kirk Dougals’ Doc Holliday is a hoot. It is my second favorite take on the character, trailing very closely to Val Kilmer’s. Have you seen ‘Doc’ starring Stacy Keach as Holiday? It is another version of the story told from Doc’s view and it portrays Earp as an opportunist using his badge to gain political power and wealth. 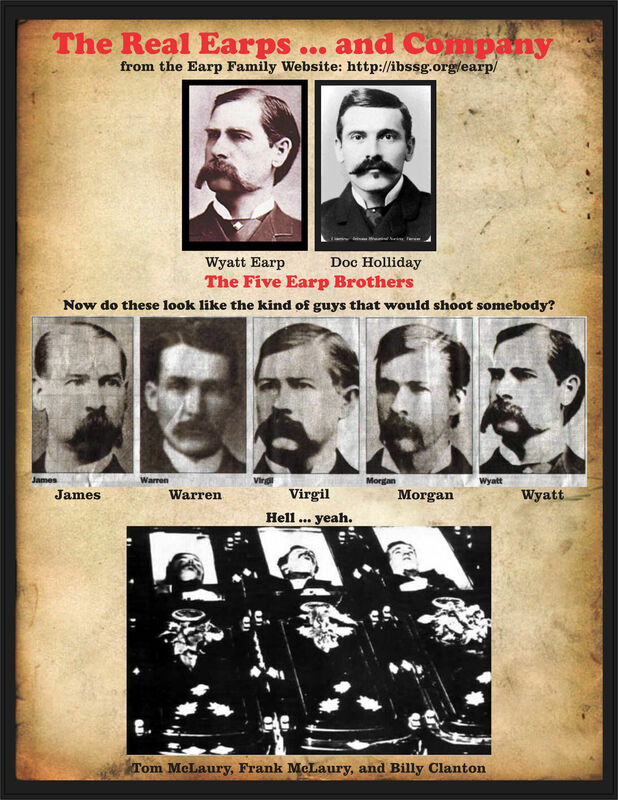 The Clantons look almost like the victims. Another of my favorite Westerns is Sam Peckinpah’s ‘Pat Garrett and Billy The Kid’. It is a great movie even though Billy is played by a man in his mid-thirties, and the real Kid never rode with Garrett. That doesn’t prevent my enjoyment of the great storytelling and interesting characters. This movie had some great western character actors for support like Slim Pickens, Jack Elam, LQ Jones, Chill Wills, RG Armstrong, Matt Clark, Paul Fix, Harry Dean Stanton, Gene Evans, Dub Taylor, Bruce Dern, Jason Robards, Barry Sullivan, and Katy Jurado. That is quite a line up. How could you lose with support like that? I enjoy your site, and plan to explore it further. Keep up the good work and keep watching westerns. You are very kind – thank you. 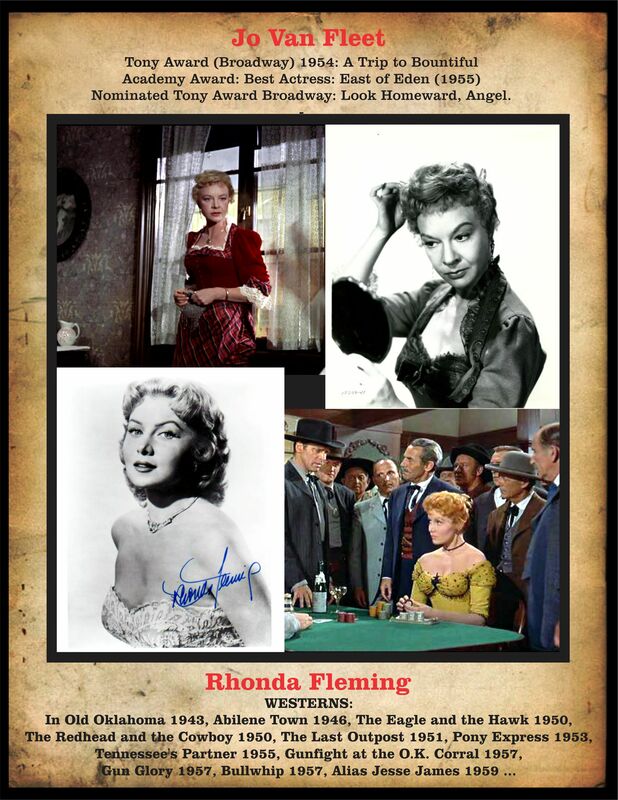 I openly admit that I am a mere fan – not an expert on the Old West or Western Movies. I just love the Genre – and pay homage to it. No doubt about it. None of the other depictions could match the Star Power of these 2 guys. A few make a nod toward known history, though usually they embellish mightily. But, like you say, we aren’t watching or expecting a documentary. I’ve met a few picky folks that won’t allow themselves to enjoy these movies because of historical inaccuracy. Too bad for them, I say. Westerns can be like SciFi – used to make a statement – Political, Spiritual, Social … you name it. Or simply be straight-up action movies. Most outsiders see them as simply that – and the genre is rarely taken seriously – with a few exceptions like Eastwood’s Unforgiven that won top Oscar. Being able to combine any of these elements and still be Entertaining … that’s the trick. That being said, there was a lot of bloodshed in Tombstone. 26 people are said to have been killed in The Bird Cage Theatre alone – just one of hundreds of saloons, brothels, etc. 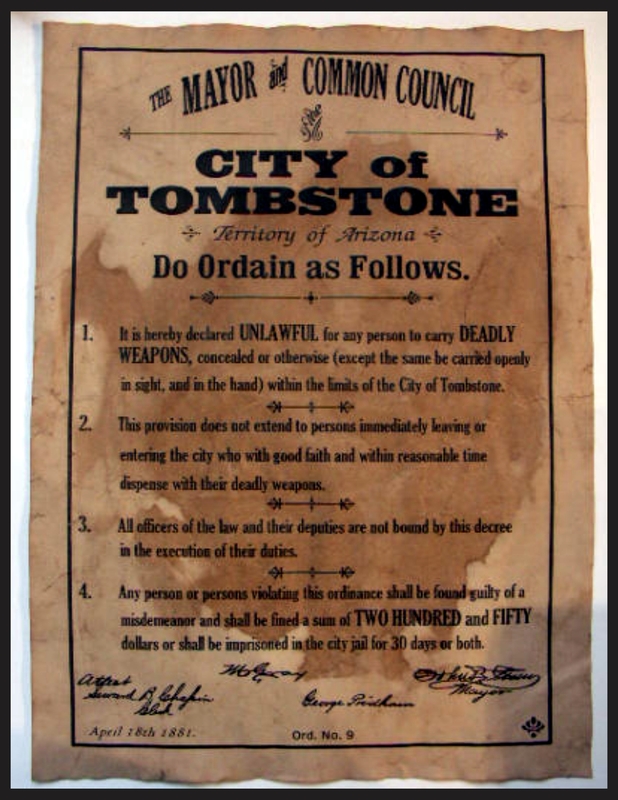 that made up Tombstone in it’s heyday. It’s pretty certain they weren’t classic ‘show downs’ – as you say – but somebody surely went down. Much is unknown, though we do have some idea of Earp’s and Holliday’s personalities. Wyatt is portrayed pretty well the same in all the movies: a humorless (thug?) with a badge – A serious guy who doesn’t smile much or laugh. And kills badguys. I’m guessing this is fairly accurate? I like Kirk the best. But Robards, Kilmer, Quaid all do a great job. I think Jason Robard’s Holliday portrayal in ‘Hour of the Gun’ (1967) has some nice humor in it. I have not seen this. Keach can do some good acting. I’ll have to catch up on that. Thank You. I just found out that I can watch the whole thing on YouTube: https://www.youtube.com/watch?v=NxoRm-Fe4aM – Image quality is not that great though. Depending on whose side you might take, some folks favour the Clantons. Yeah Kris sure doesn’t look much like the Kid does he? But this is a hell of a Western. A top 10 Classic. Pek sure loved Westerns and knew how to make them. 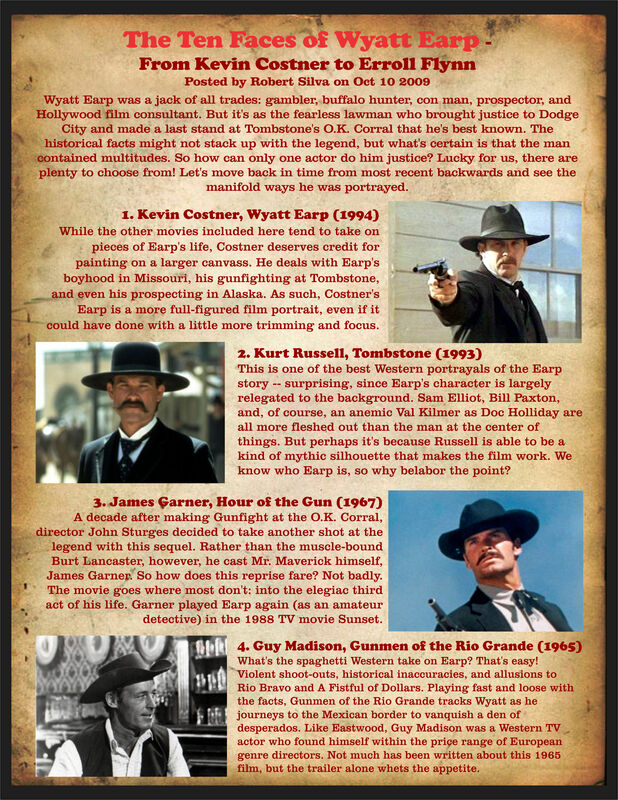 As you say, an awesome cast – a who’s who of Western actors and Western support actors. Thank you my friend and thank for dropping by with some great comments. I’ll be following up on Tombstone and the OK Corral shortly. See you then. Wyatt’s legendary status as the hero at the OK Corral was mostly the result of the fictional biography ‘Wyatt Earp, Frontier Marshall’. 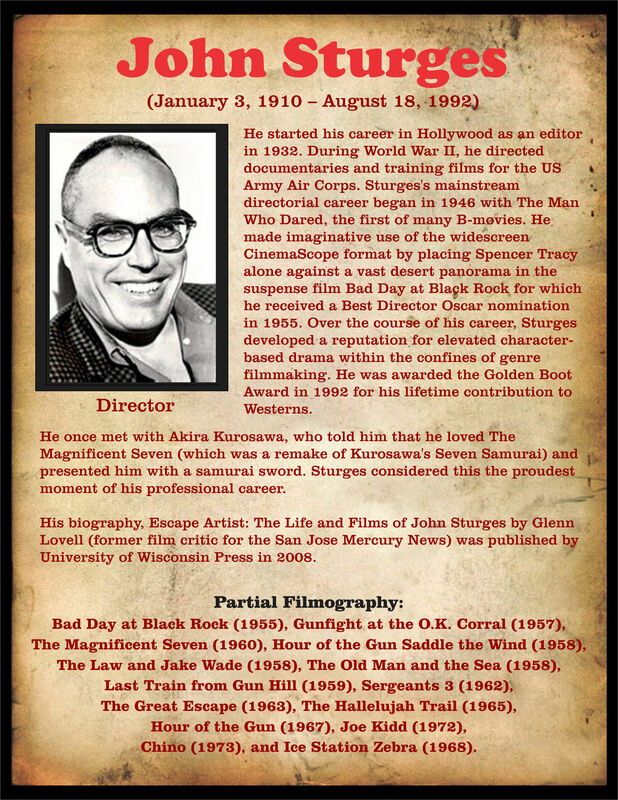 It became the basis for Hollywood’s interpretation of Earp the heroic lawman. In real life, Wyatt was never more than a Deputy Marshall, and at the OK Corral, he was just an appointed deputy to his brother Virgil, who was a much more accomplished lawman than brother Wyatt. Virgil even went on to serve as a sheriff after he had lost the use of one arm in Tombstone. This not to say Wyatt was not brave. Even though he had only been in one gunfight prior to OK Corral, his accomplishments as a lawman in Dodge City still stand. His exploits were exaggerated and built into a legend that was not really widely known until after his death. Good information – thank you. It’s tough correct the Legend – after so many movies and TV shows. The Legend kind of gets embedded in our culture. I always like to know the truth. But I can still enjoy the movies – even knowing they are not accurate. I have just watched the 1957 film on local TV and was surprised to realised that the shootout at the end was on the SAME set as the one in Rio Bravo (I recognised the dry creek and a wall with a hole in it)! After a bit of research I found that location to be Old Tucson Studios. In that film there wasn’t much to identify the corral other an an “OK” sign on a stick and a much better one on the side of a barn. Good eye ! I’ve been to Old Tucson Studios – it’s an active tourist attraction. You can spend several hours there – if you can take the heat. 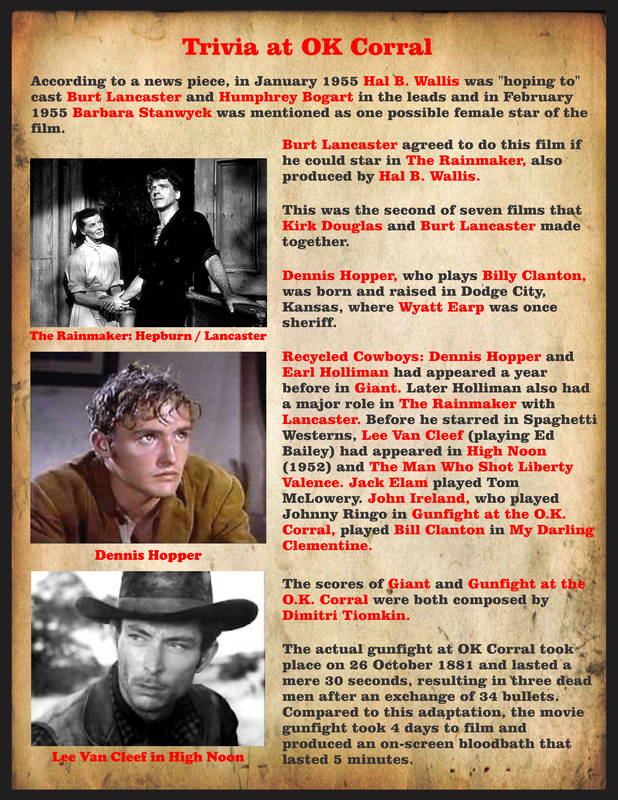 Yep, they filmed a LOT of Westerns there – movies and TV shows. Some things seem a bit run down though – it’s not in it’s hey day. But still fun. 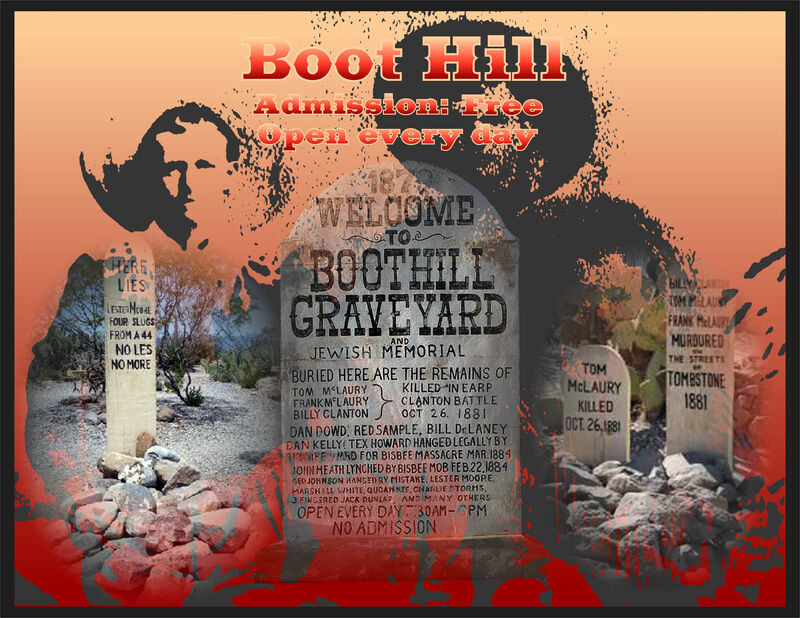 Not too far away is Tombstone and Boothill – also fun to visit. 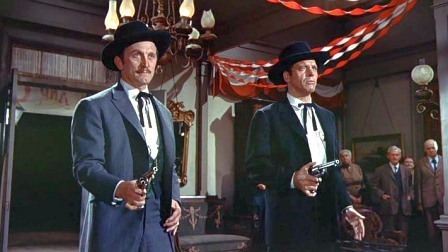 ‘Gunfight at OK Corral’ with Douglas and Lancaster is still one of the Top Classic Westerns of all time.